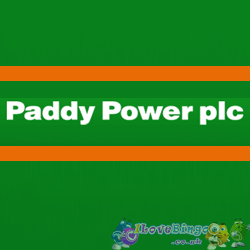 Paddy Power PLC was founded in 1988 and quickly became one of the most recognised name in the Industry. 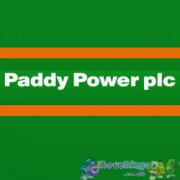 With over 210 shops across the Republic of Ireland and 161 shops in the UK, Paddypower is the largest bookmaker in Ireland and holds a leading position in the UK. Online Betting: Launched in Ireland in 2000 and subsequently released in 2001 in the UK, the online division remains the fatest growing of the business. The company has established itself firmly at the top five UK online betting sites. Expansion into geographical areas outside of the UK & Ireland is highlighted by the recent addition of a Spanish language site. Paddy also focus on a wide number of ongoing enhancements being made to both site functionality and the range of betting opportunities. Poker: Powered by the giant software provider and network Playtech, Paddypower launched their poker site in 2005. The site has became the biggest poker room in Ireland. Online Bingo: The company launched their online bingo in 2006 which is operated by Playtech - Virtue Fusion. With a strong TV ad campaign, the brand has became one of the largest destination for Bingo Players. 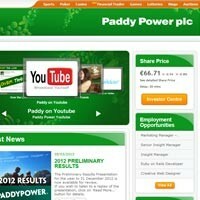 Online Games: In November 2004 Paddypowerplc entered the world of online gaming with 3 games. The company has since expanded its portfolio to over 130 games, pushing the division to the forefront of the online gaming industry. Telephone Betting: In 1996, the brand's telephone betting operation was born. With over 360 incoming lines, their call centre delivers a fun, fair and friendly service where discretion is paramount. Sportsbet: 2009 saw paddy power the highly attractive Australian betting market by acquiring 51% of Sportsbet Pty Limited (‘Sportsbet’). Sportsbet accepts wagers on Australian and international horse, greyhound racing as well as local and international sporting, political and entertainment events.